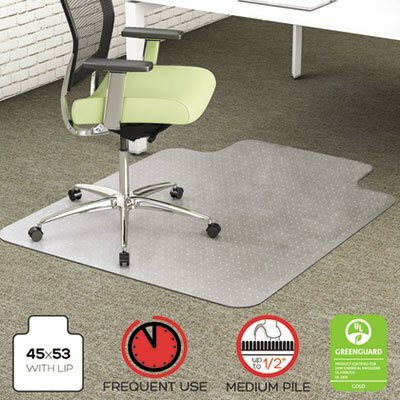 EnvironMat Recycled Anytime Use Chair Mat, Med Pile Carpet, 45x53 w/Lip, Clear, Sold as 1 Each by Generic at Momiji Studios. MPN: OFCH762029. Hurry! Limited time offer. Offer valid only while supplies last. Earth meets elegance. Respect the planet with EnvironMat?, the 100% post-consumer recycled chairmat made from over 128 recycled beverage bottles. Earth meets elegance. Respect the planet with EnvironMat?, the 100% post-consumer recycled chairmat made from over 128 recycled beverage bottles. User-friendly and environmentally responsible. Easy-glide rolling surface provides effortless chair movement. Classic straight edge finish. Mat Type: Chair Mat; Application: Carpets; Material(s): PET; Style: Lip. E.S. Robbins 124173 45x53 Lip Chair Mat, Performance Series AnchorBar for Carpet over 1"